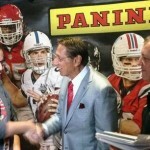 Hall of Fame Quarterback Joe Namath & Panini America Inc.Team Up Once Again! Hall of Fame Quarterback Joe Namath & Panini America Inc.Team Up Once Again!!!!!! Namath along with Dr. J, and Tom Glavine , were some of the featured guests who were in attendance.” Panini and Joe Namath have been a great team for many years. I am grateful for the support of Mark Warsop and Joe White for inviting Joe to be part of Panini’s VIP Party and including Joe in their new Football Card releases, said “Harlan J. Werner Ceo of Sports Placement Service Inc.